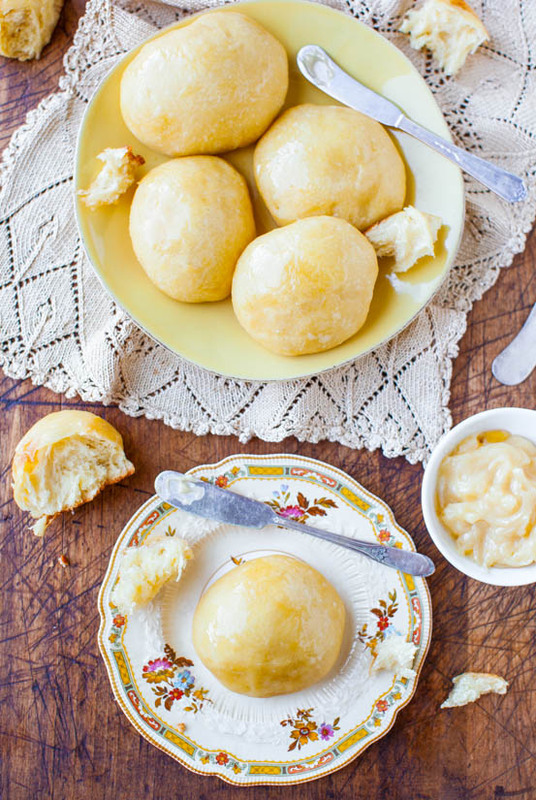 There’s nothing almost nothing better than warm, fresh, buttery homemade dinner rolls. 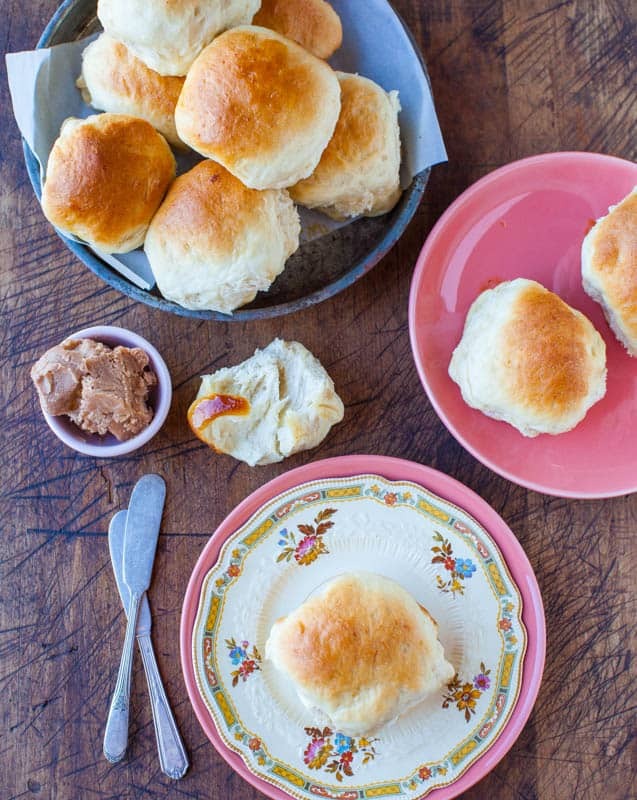 The only thing better than the rolls is that the dough is a make-ahead and no-knead dough. The rolls are so easy to make. 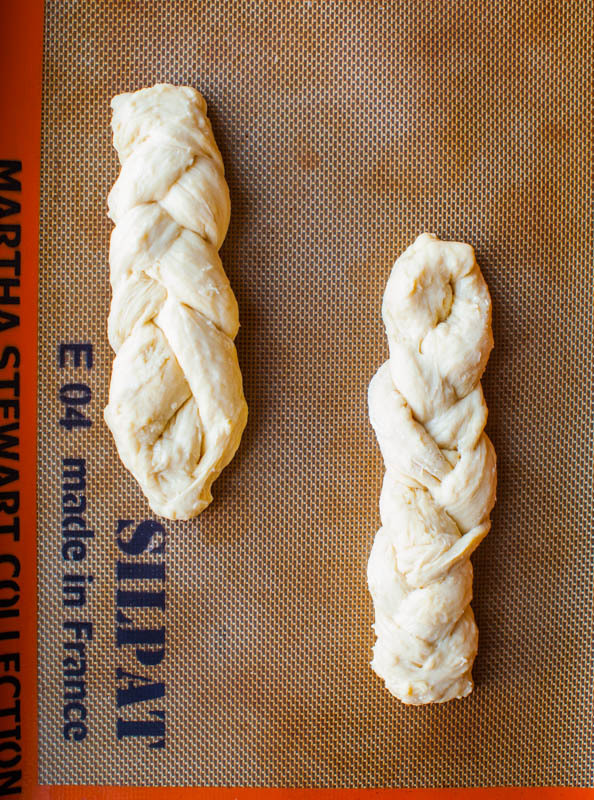 I adapted the dough from my Challah recipe, which uses the Artisan Bread in Five Minutes a Day method. The principle is that you make a big batch of dough, keep it in the fridge for up to 5 days, and just bake off what you need on that particular day. It sounds too good to be true but it works. They’re practically work-free because there’s no-kneading involved. Since there’s no kneading, I don’t even use my stand mixer and stir everything together with a wooden spoon in a bowl. 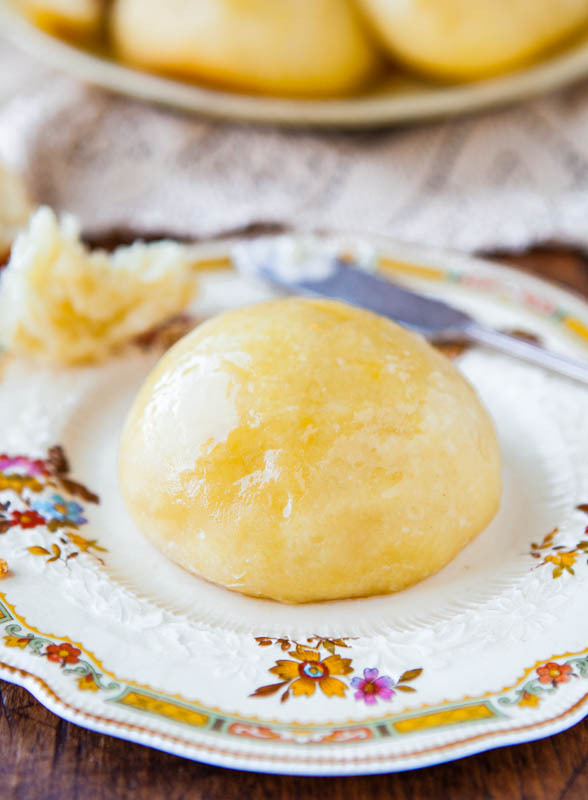 Simply combine warm water, yeast, two eggs, honey, oil and flour. Stir, cover it for about two hours to rise, and from there you have options. You can either bake with some of the dough now, or bake later. I usually use about one-quarter of the dough, and refrigerate the rest. The recipe will yield about 14 to 16 dinner rolls, but I don’t only make rolls with this dough. Sometimes I make mini-challah loaves. Mini food tastes better. Or I make mini loaves of bread in Mini Loaf Pans. These pans and they come in handy for so many things and I just love them. I bake rolls in them, too. We are a family of 3 and 4 rolls is fine. We don’t need carb mania every night. You can see how much mileage I got from one batch of dough. And it’s not even that much dough, just a 3 1/2 cups flour recipe, but I love the flexibility of it. 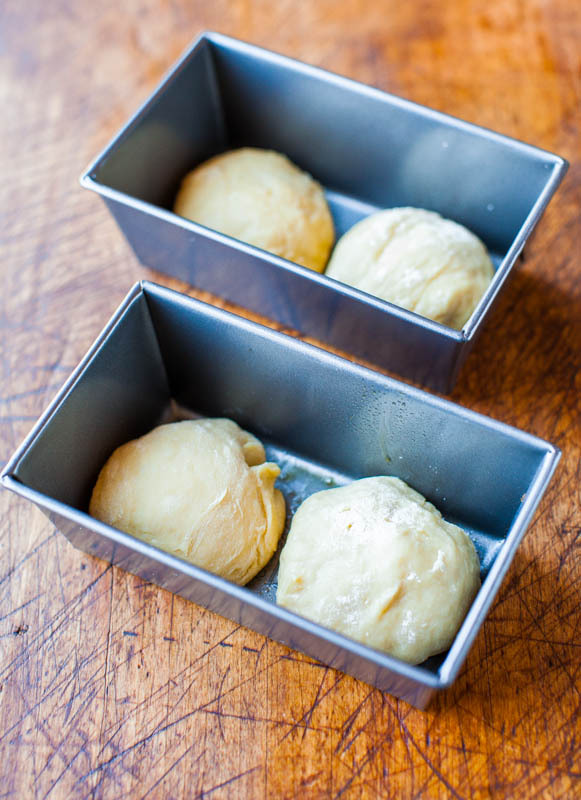 Sometimes I form the dough into balls and keep them in the fridge in a covered pie dish. About an hour before I want to bake them, I put the dish on the counter to warm up and rise. The recipe is perfect for anyone who’s never worked with yeast because it’s almost impossible to screw up. If you can dump ingredients in a bowl and stir, you can make these. 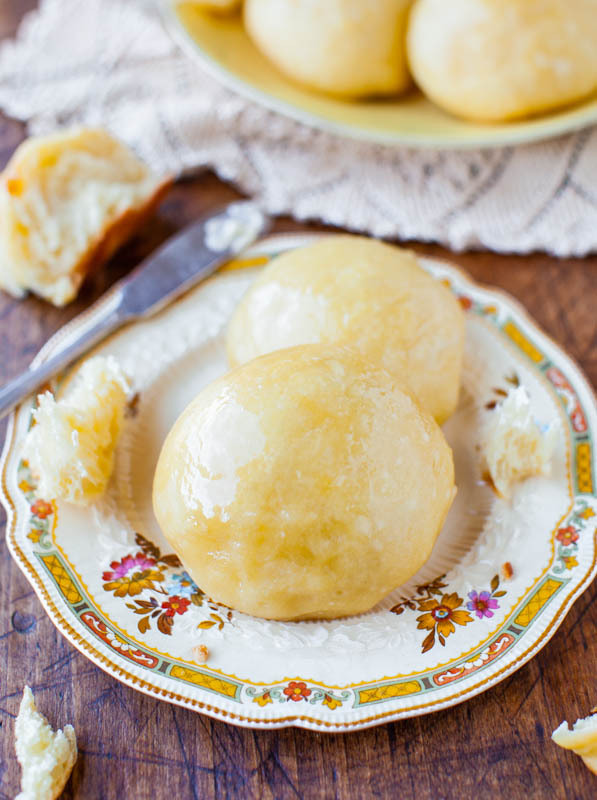 I like to brush the tops with honey butter before baking and it makes them even more irresistible. Schmear the extra honey butter on after they’ve baked as you’re devouring them. So good. The rolls are light, soft, and fluffy. I just want to rip them apart and drench them in honey butter. Nothing beats warm, fresh, homemade bread. And for the rest of the day, your house will smell like a bakery. If you literally need to butter someone up in your family, these will do the trick and earn you some major brownie points. You can just pretend that you slaved away over them. 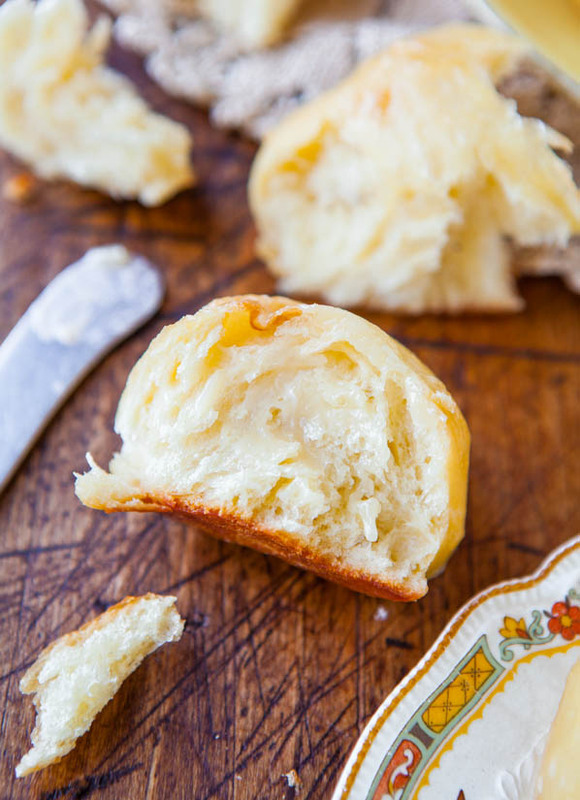 These soft, light, fluffy dinner rolls are so easy. They’re practically work-free because there’s no-kneading involved. The beauty of this dough is that you can make it ahead of time, refrigerate it, and when you’re ready to bake, grab a hunk and bake off only what you need. 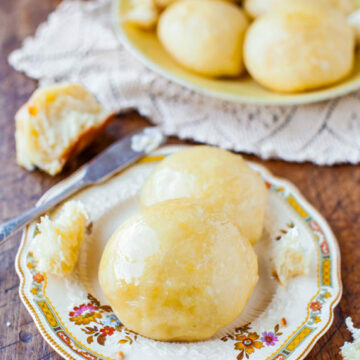 You can use it for more than just dinner rolls, too. 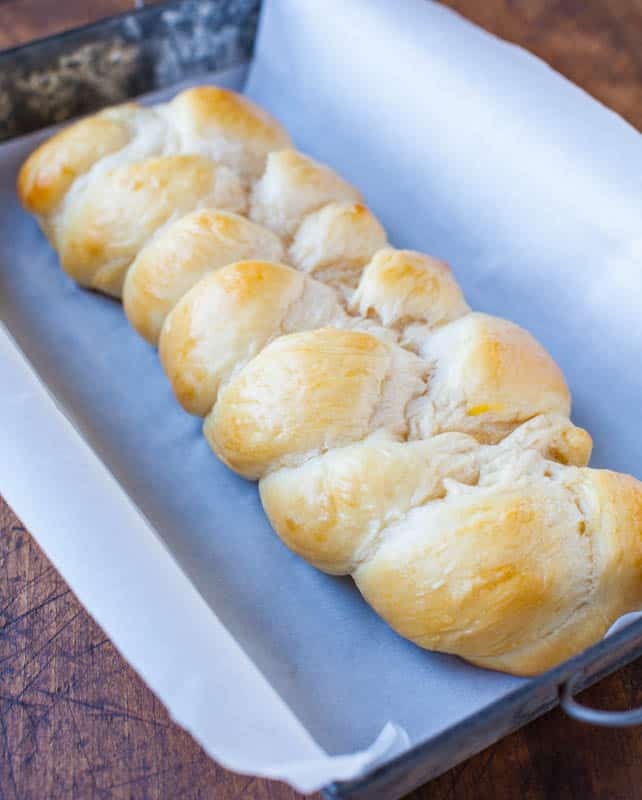 Try challah or mini-challah, mini loaves of bread, or even cinnamon rolls. So many possibilities and knowing you have dough in the fridge waiting makes having fresh bread or rolls an easy reality. 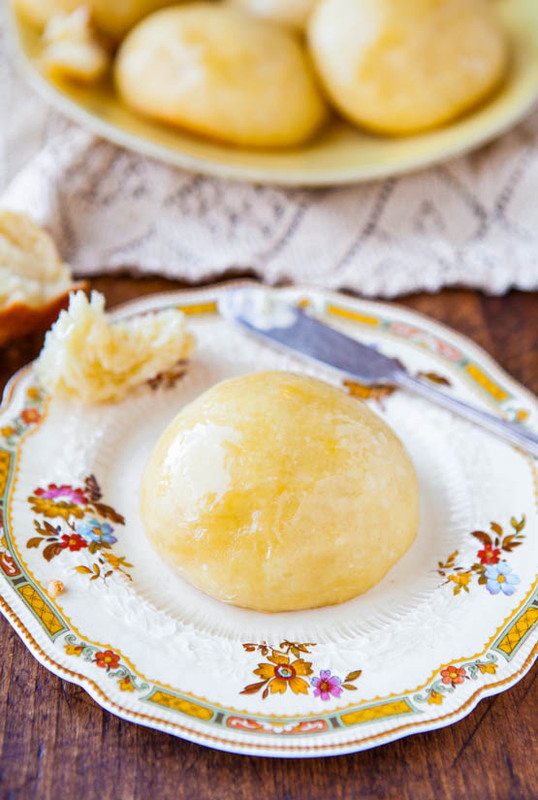 For the Rolls – Pour water into a microwave-safe measuring cup or bowl and warm it to manufacturer’s directions on yeast packet, about 45 seconds on high power. Take the temperature with a thermometer. If you don’t have one, water should be warm to the touch, but not hot. Err on the side of too cool rather than too hot because you don’t want to kill the yeast. Add the eggs, oil, 1/4 cup honey, optional salt, and whisk to combine, about 30 seconds. Add the flour and stir with a wooden spoon to incorporate the flour. Stir for about 1 minute more. This is as much ‘kneading’ as the recipe requires. Dough will be thick, lumpy, bumpy, and not smooth. This is okay. 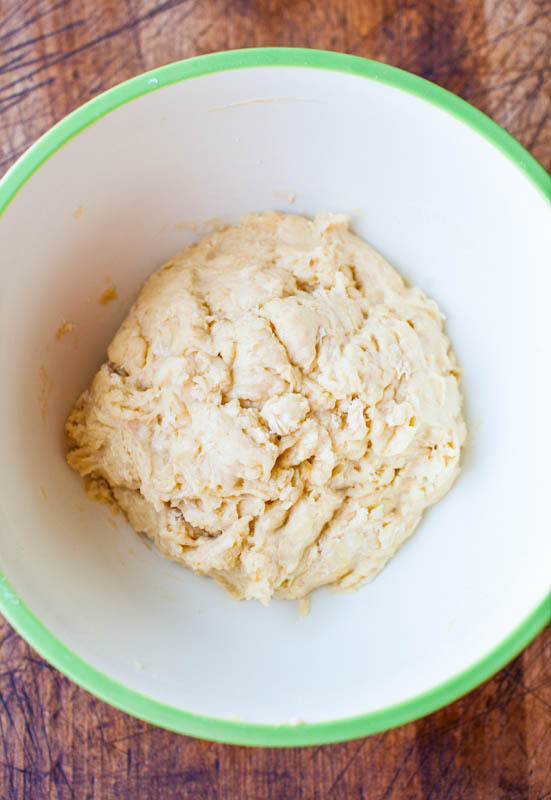 Make a ball with the dough in the center of the bowl. Cover bowl with plasticwrap and place in a warm, draft-free place to rise until doubled in bulk, about 2 hours. Tip – Create a warm environment by preheating your oven for 1 to 2 minutes to 400F, then shutting it off. This creates a 90F-ish warm spot. Slide the bowl in and wait while the yeast works. Just make sure your oven is off. At this point you have a choice… If you plan to bake now (through step 11) punch dough down, remove it from bowl, and turn it out onto a well-floured surface. Knead it only so much as necessary to shape it into balls for rolls (I divide the dough in half, and if I’m making rolls, I make 8 rolls from each half, for 16 rolls total, they’re just a bit bigger than golf balls). 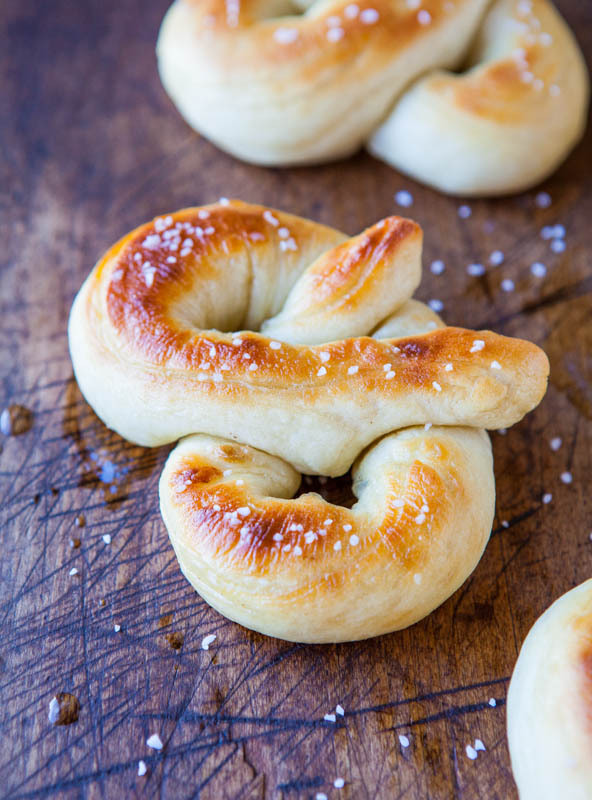 Or form desired shapes such as mini loaves, challah, breadsticks, pretzels, etc. Use only what you need and save the rest for later in the refrigerator. 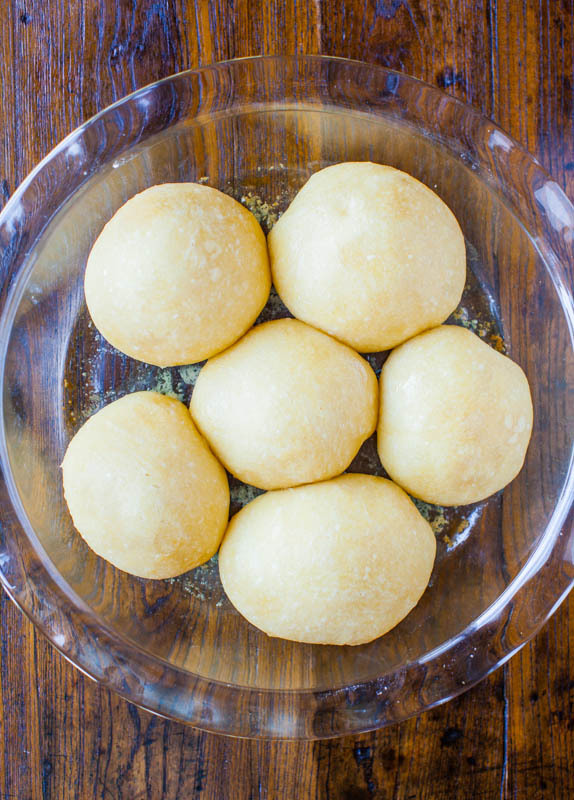 Place balls of dough in a cooking sprayed round baking dish or pie plate, or in an 8×8 or 9×9 pan; size depends on how many you’re making. They can be close to each other, but if they’re overly squished they’ll bake into each other. Cover baking dish with plasticwrap, and allow rolls to rise in a warm, draft-free environment for about 1 hour, until almost doubled in size. I use the preheated oven trick again. In the final minutes of rising, preheat oven to 350F. 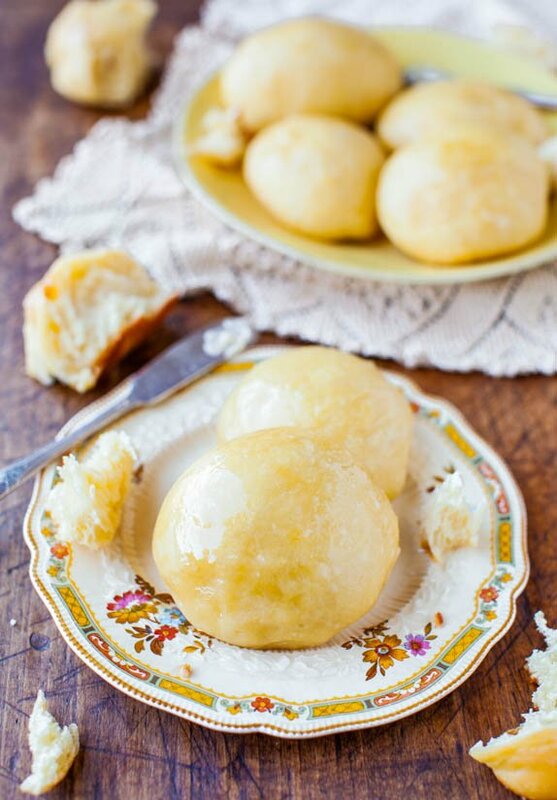 Bake rolls for about 15 to 18 minutes, or until lightly golden and puffed. 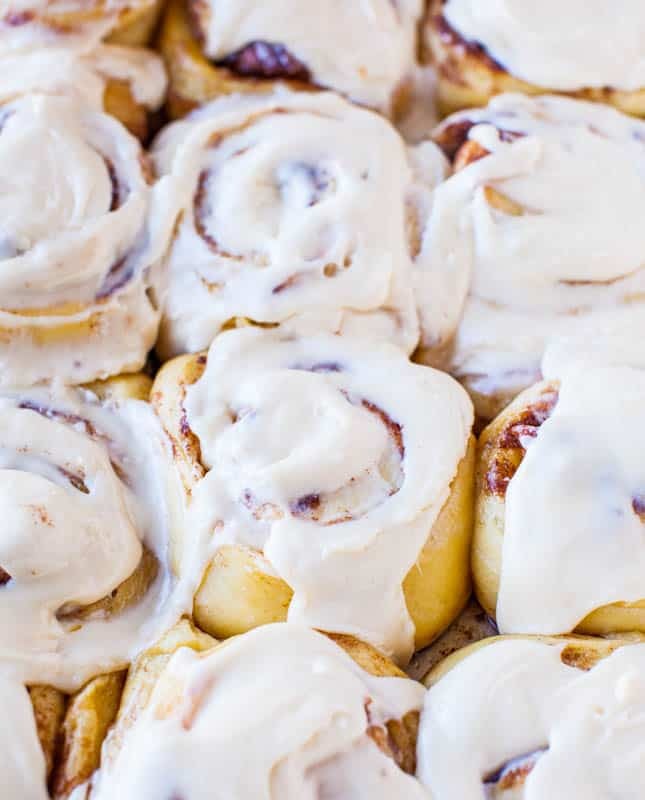 Baking time will vary greatly based on how many rolls you’re baking, or if it’s another shape such as a mini loaf, the size of the pan, and personal preference. Watch your bread, not the clock. Serve as soon as bread is cool enough to handle. Rolls are best fresh, but will keep airtight for up to 4 days at room temperature or may be frozen for up to 4 months. 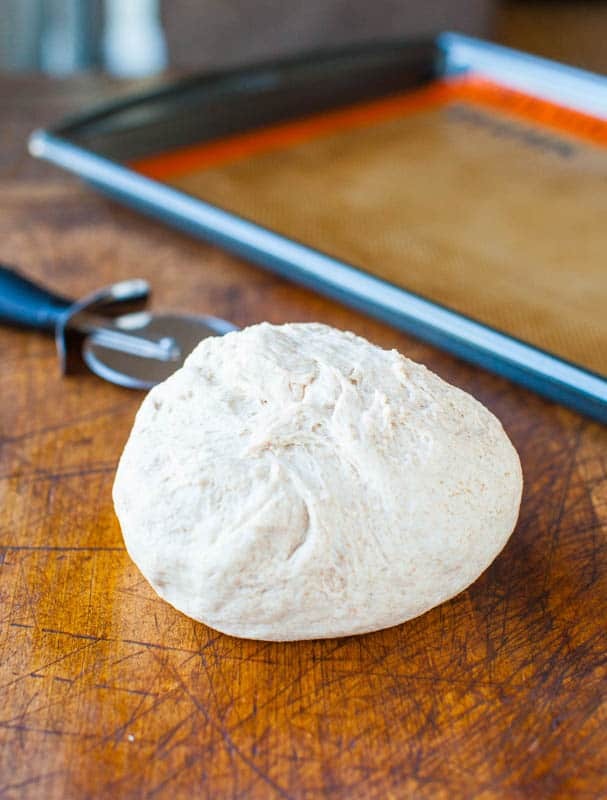 If you plan to bake later – Take dough that’s risen for about 2 hours from step 5, keep it covered, and refrigerate it. 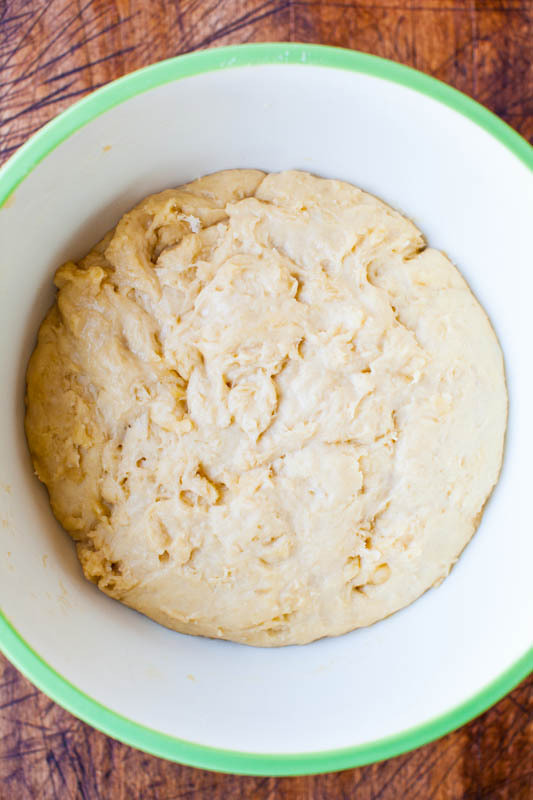 Dough may be kept refrigerated for up to 5 days before baking. When you plan to bake, pick up at step 5 and follow through step 11. Do you make dinner rolls or bread? What’s your favorite recipe? Hi Averie! I’ve made a couple of your recipes before and they’ve all been GREAT so when I saw this I knew I had to try it. 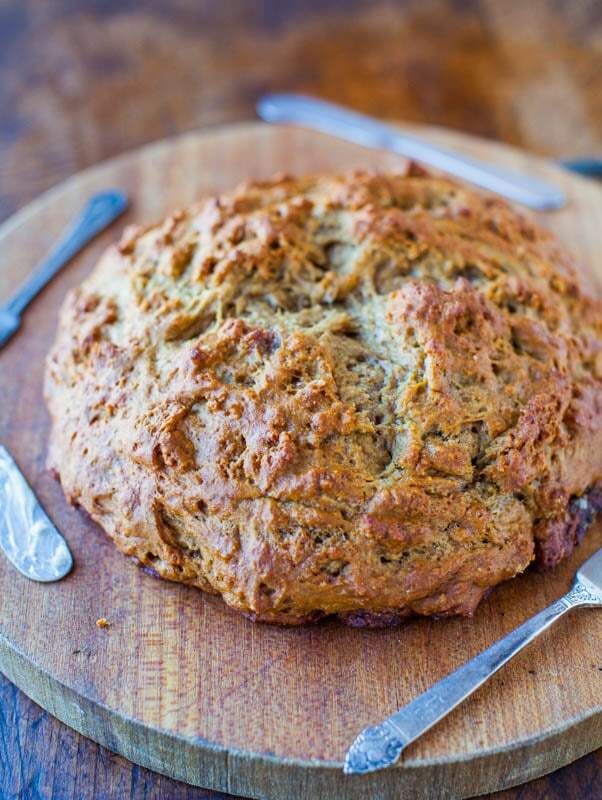 The texture was AMAZING – super light and fluffy! But the bread was flavorless :/ I’ve never made bread before so I don’t know if I did something wrong. I followed the recipe and directions but used grape seed oil and raw honey. I noticed you don’t put much salt in your foods so should I have used more salt? I used maybe a couple of pinches. I looked up other bread recipes after the fact and saw that most use 1/2-1 tbs of salt. Would that be the culprit? Thanks in advance! I don’t add a lot of salt to bread recipes because it can impede yeast and rising, and also because for health reasons, we’re very conscious of our salt intake in my family. 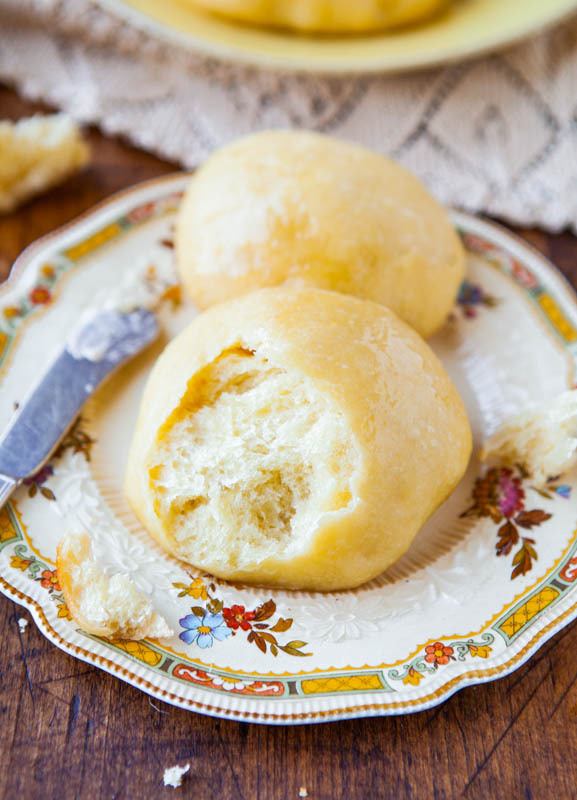 Plus, with adding the honey butter, I prefer the rolls to be a bit more sweet than savory, but if you want the bread to taste saltier, add some salt to taste. It may take a few batches to find out what that amount is for your personal preference. Glad that you loved the texture and overall sounds like you enjoyed them! Glad they were PERFECT for you! That is music to my ears and met with unanimous approval no less…awesome! Thanks for trying the recipe and sharing with your family! 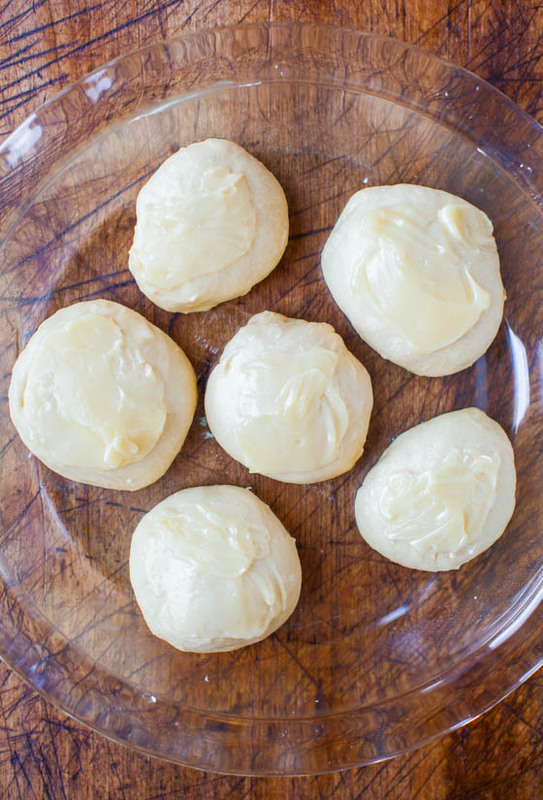 If using butter should the butter be melted first? I tried with oil, I used sunflower and they came out good but I prefer crustier tops, and I think they need more salt. All in all a great and easy recipe. Melted butter in the batter rather than oil, yes, you’d melt it. 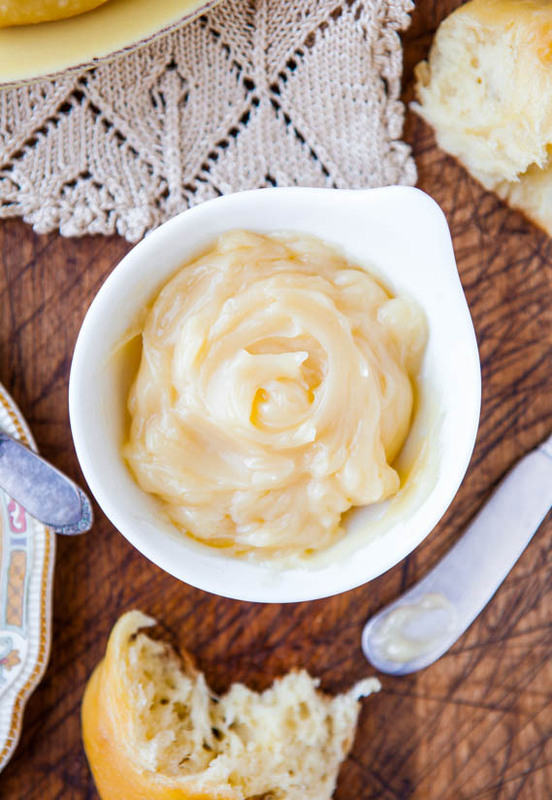 Butter makes things crispier, oil makes things softer so the dough itself could become less soft with using butter. But sounds like that’s what you want. And salt is so personal so just salt it to your own tastes. Glad you liked the recipe! 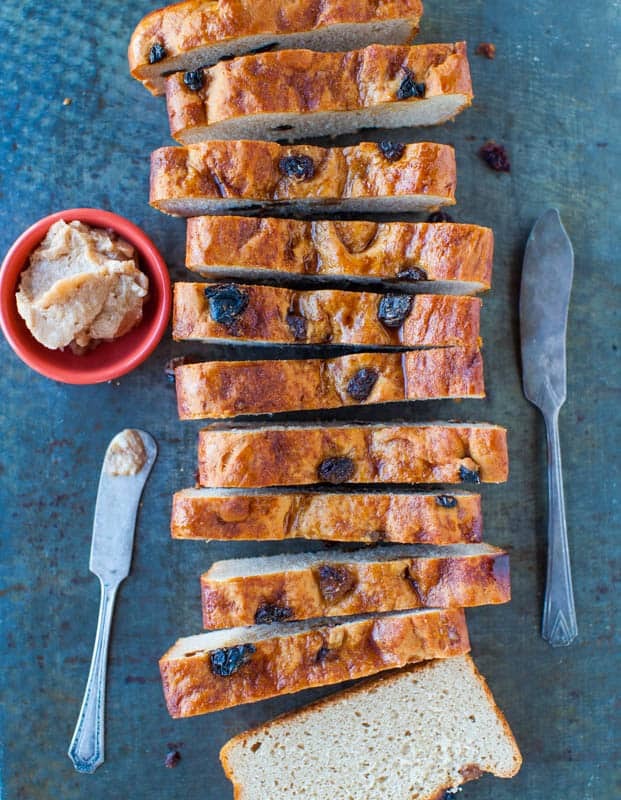 can i add raisins to this for a easy raisin bread? or will it not work with the texture? I think they’d be fine with raisins. I also have https://www.averiecooks.com/2012/12/raisin-bread-for-raisin-lovers.html and https://www.averiecooks.com/2012/11/oatmeal-raisin-rolls.html which you may like! 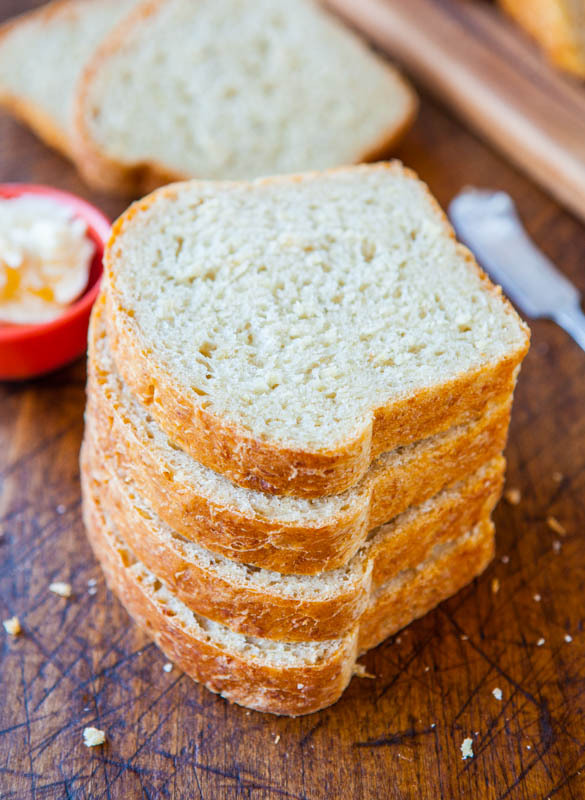 Hey there, these look soo good and soo easy, I really want to try them, but I can only do whole wheat flour, I usually use bobs red mill whole wheat white bread flour but I wasn’t sure if that would affect anything with this recipe, in the past I know that whole wheat hasn’t been completely interchangeable in any recipe…. Tried and true and if you try to make these here, they won’t turn out so make the ones I linked! I made these today. I followed the instructions perfectly. The dough seemed to rise fine during both rises. However, while baking, the rising stopped. They are dense, hard,and flat. The yeast was store brand active dry that I just bought yesterday. I used 1 package. I warmed my water to 105, added the yeast and let sit for 10min. It did not foam. I am really bummed because this is my 1st time to make bread from scratch and I was so excited. What happened? The fact that the yeast didn’t foam is a telltale sign that the yeast wasn’t alive, or was barely alive. Despite it being fresh, some packages can be duds. I have to say this is a situation where I REALLY trust Red Star yeast and really don’t cheat on them because it’s not worth my time and ingredients to wonder maybe, if, possibly…there’s something wrong with the yeast. Personal preference, but it never lets me down. I would use a trusted name brand rather than store brand and make sure it foams before carrying on with the rest of the recipe. Corn oil, hmm, I don’t use it but I don’t think that’s the culprit as much as possibly just not letting them rise long enough, not baking them fully through (underbaked bread will deflate upon cooling), and/or not using quite enough flour, and/or not using super fresh yeast. 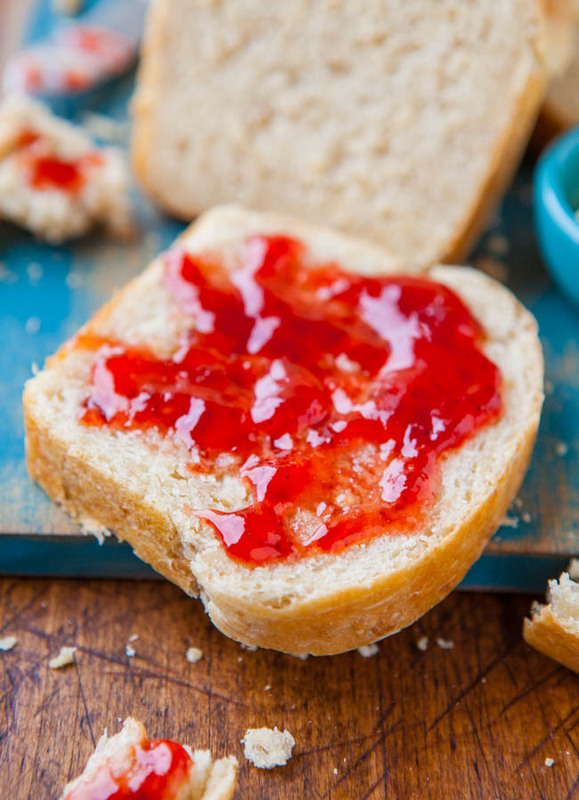 With bread, there are lots of variables and I would make sure all ingredients are super fresh, make sure to bake long enough, use a good quality flour like King Arthur (truly makes a huge difference) and Red Star yeast, and make these small changes and I think you’ll be set next time. Are the liquid amounts correct? My dough turned out more like pancake batter. I had to add an extra 2 cups of flour to give it the shaggy look in your pictures. Yes they’re correct. Maybe you accidentally added more water than you thought you did? Glad you were able to get the dough to come together. Right you are! I double-checked and realized I used a 2-cup measuring cup rather than a 1-cup, so I put in twice the amount of liquid. Although my “modified” product was tasty after adding 2 cups of flour, let me do this again the right way.